This month's update will arrive on January 31st (same day as the secret ending patch for KH3). The screenshot shows Elrena and her Chirithy in the abandoned warehouse, with Chirithy crying out "Who's there!?" In the following months, the story updates will take us to a new world. As Nomura always says, "Please look forward to it." The wording.... Is kinda suspicious, it is not ? then again it's Nomura. But yeah, I can't see why they're still so hush-hush on it. There's no benefit in it. For some reason, they tend to like saying "X is on the move" when teasing story stuff. It's definitely not the first time they've used this phrase. That being said, I do firmly believe he has a hidden agenda. Same. It would have been the day right before KH3 releases, a perfect opportunity. But for the update to coincide with the secret ending patch, it's pretty damn suspicious. Ohhhhh man. This is interesting and exciting. Since the update could tie in with the secret ending maybe they could reveal the new big bad as another resident from the age of fairy tales. Agreed. Plus if Wreck it Ralph was confirmed earlier that would have saved us months of speculating if it was still in KH3 or not. WHO CARES ABOUT ARTHURâ€™S SMART FRIEND?! THE NEW WORLD AT LAST!! â€¦Sorry, I got carried away. Saying that Brain is â€œon the moveâ€ and coinciding with the secret movie does feel a bit suspicious. Trying to avoid spoilers, but is this the last update for this mobile game? or are there more planned after? This month's update will arrive on January 31st (same day as the secret ending patch for KH3). 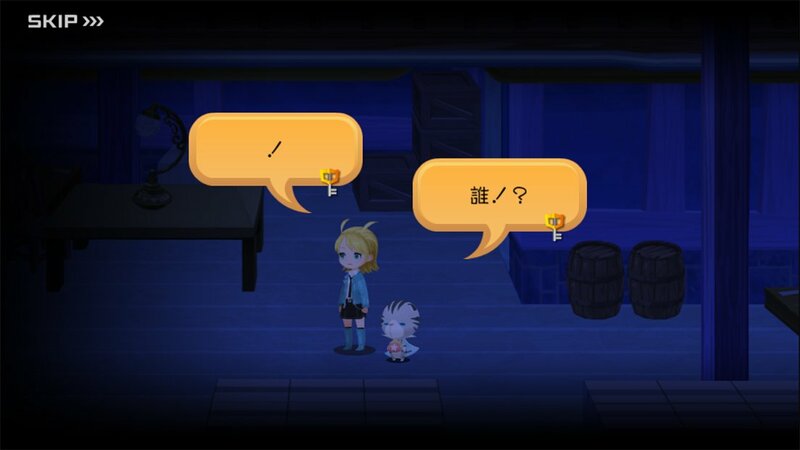 The screenshot shows Elrena and her Chirithy in the abandoned warehouse, with Chirithy crying out "Who's there!?" "HOOO, BOY!" ^2, man! First we theorized that Elrena and Chirithy would find Gula's Foreteller Robe in there, but since this is a data recreation, maybe they'll witness the exact moment Streritzia gets killed?! Brain seems to be amounting to be the next saga's villain. Edit: @Ballad of Caius, you don't need to spoiler tag story stuff in a thread about story updates. Basically, if Union Cross is a sleeping world, Sora gets the power of waking (that he was supposed to get from Dream Drop Distance), awakens the sleeping Daybreak Town, and by waking up the sleeping Daybreak Town, it retroactively time shifts Union Cross from being a game set in the distant past, to a game that comes after Kingdom Hearts III but before Kingdom Hearts IV. So yeah, the release of this story update around the same time as the (intended) international release of this game may give this 4th dimension-mind-boggling theory some credibility. I just want it to be true because of how insanely Nomura it is. My excitement for a new world is insurmountable, of course, but with Ralph being a Link I think it might be his world (unless Square throws a miracle ball but nice joke, me).